Lysa & Huey Ink! : Off The Crafty Grid! "Next On Hoarders - Woman told to pack up and get out"
"Woman spent A million dollars on craft supplies, dies broke - pictures to prove it"
"When they found her in the corner she was mumbling something about a heat gun!" Here is how it all started, You know simple. Some paper, some glue and a computer. In all fairness I think I had a punch or two. I had a little crafty spot in the corner of the dining room. It was easy to break it down at the holidays. I really liked this space because in the summer I had a great view of the pool. I was crafting right in the center of the family action. But then I started to collect more supplies. And not just supplies but crafty good machines as well. I grew so much so that my little bit of crafty heaven became a nuisance to the rest of the family. Not only that I could no longer hide the crafty goodness when it was time to have a dinner party or the family over at Christmas. So the Hubster says "let's move you down to the den" and all of a sudden I had more room than I knew what to do with. OK, so I did know what to do with it. And that was to collect yet more supplies. 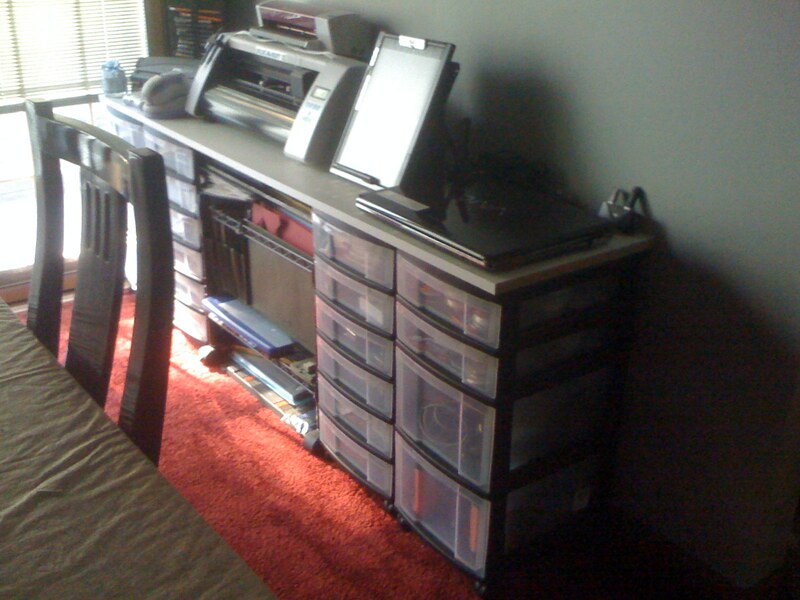 But I loved my crafty good (and messy) workspace. I was a happy little crafter hidden away in the den. I didn't even mind the red carpet or the circa 1950's paneling. Not even the vinyl brick piece! Here is a picture of my work desk. I knew exactly where everything was and could lay my hand on it in an instant. Some how things kept growing. It seemed like if one of something was good, then two would be better. This I now realize should be a thought process reserved for dollar bills and only dollar bills. You know what is really scary? If you asked me for my 1-1/2 inch scallop square punch, I could hit that pile of boxes and get it for you. So here is the deal. Three rooms in three months. The only hard room is the den because after all these years the paneling is coming down. The upstairs rooms only need minor work like paint, flooring and such. I will leave you with the first picture of Sam's new livingspace. I hope it comes out just as she hopes. I guess you can say I will be off the crafty grid for a few months as we do some work around here. I told the Hubster I needed to be up and running no later than August and he thinks I will be back in a space by early July. My posting over the next weeks (months) will most likely be home repair as I am trying to keep a diary of the whole room switch action. Thanks for stopping by and check back soon. I am sure I can slip in a crafty post somewhere. I agree with Dad you will be back up and running by July I'm determined Mom. We got so much done this past weekend and next weekend I'm Dry walling.... hmm dry wall never done it before, and with all the videos I have been watching they all tell me that it looks easier then it is oh great it's going to be another weekend like building door frames, but hey I'm learning as I go. Once I'm done with that stuff it will be smooth sailing and the rest will go very fast. Thanks for all you did this weekend prepping and designing my new room. It's going to look amazing!